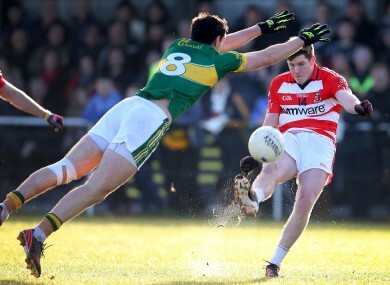 Kerry defeated Cork IT while Cork were far too strong for UL. Kerry's Anthony Maher and CIT's Donal Óg Hodnett. THE LATEST CHAPER in the Kerry and Cork rivalry will take place next weekend after both sides won today’s semi-final clashes in the McGrath Cup. Kerry defeated the students of Cork IT by 2-12 to 0-13 at John Mitchels GAA grounds in Tralee. Stephen O’Brien notched their first-half goal as they lead 1-7 to 0-6 at the break. A second goal by Barry John Keane in the second-half helped push Kerry 2-9 to 0-8 clear after quick thinking by Bryan Sheehan set him up. That goal helped secure the victory for Eamonn Fitzmaurice’s side despite some late points by CIT. It was all too easy for Cork in the other semi-final tie as they ran out 6-16 to 0-7 winners over the students of UL in Mallow. Cork lead 3-8 to 0-5 at half-time with Colm O’Driscoll, Míchéal O Laoire and Donncha O’Connor bagging their goals. Their dominance continued after the break with Daniel Goulding netting before Barry O’Driscoll shot home their fifth goal in the 48th minute. Goulding raised his second green flag and Cork’s sixth in the 56th minute as Brian Cuthbert’s team ran out winners by a 27-point margin. The venue for next weekend’s final has yet to be decided in what will be the first Kerry and Cork meeting in a McGrath Cup final since 2006. Email “Kerry and Cork to contest next weekend's McGrath Cup decider after semi-final wins”. Feedback on “Kerry and Cork to contest next weekend's McGrath Cup decider after semi-final wins”.